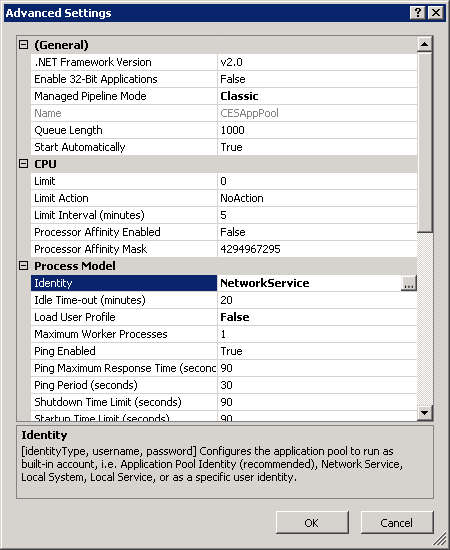 By default, in IIS the CES search application pool runs with the NT AUTHORITY\NETWORK SERVICE system built-in identity. In certain cases, you may want to find or change the account under which the CES search application pool runs. Using an administrator account, connect to the Coveo Front-end server for which you want to find or modify the account used by the search application pool. Note: When setting up geographically distributed indexing (GDI), ensure to connect to the Coveo Front-end server of the local Coveo instance. In the Connections panel, expand the server node and click Application Pools. On the Application Pools page, select the application pool for which you want to specify an identity, and then click Advanced Settings in the Actions pane. Under Process Model, select Identity, and then click the ... button to open the Application Pool Identity dialog box. 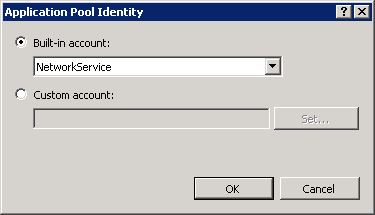 In the Application Pool Identity dialog box, the CES search application pool account is identified by the selected option (either Built-in account or Custom account). If you want to use a built-in account, select the Built-in account option and select an account from the list. Select the Custom account option, and then click Set. In the Set Credentials dialog box, type the custom account name in the User name box, type a password in the Password box, retype the password in the Confirm password box, and then click OK.
Right-click Coveo Enterprise Search 7, and then select Properties. 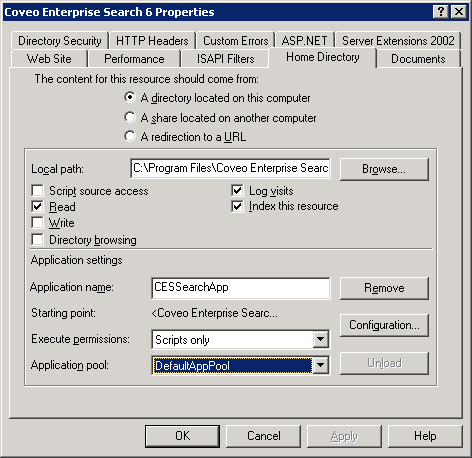 In the Coveo Enterprise Search 7 Properties dialog box, select the Home Directory tab. Read the CES search application pool in the Application pool parameter. Right-click the application pool found previously, and then click Properties. Select the Identity tab to find the identity. 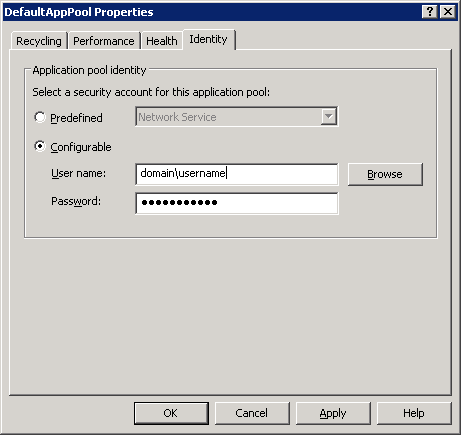 In the DefaultAppPool Properties dialog box, the CES search application pool account is identified by the selected option under Application pool identity (either Predefined or Configurable). To modify the identity, enter appropriate User name and Password, and then click OK. Note: For a GDI configuration, the CES search application pool for the local Coveo instance must run under a domain account. It is a best practice to create a dedicated account for this purpose with a strong password that never changes.